Over the years the HDPA has undertaken a diverse range of highly successful projects, The Big Backyard, the Moment in Time exhibition and Valley Variety to name a few. It has facilitated the debate over the Highway upgrade and has been a key player in the push to have the highway made safer. It has had guest speakers present on subjects of interest, it has lobbied council on issues of concern, it has co-ordinated programs like Clean Up Australia. In short a lot has been done in the interest of making the Hartley region a better place to live. Based on the object clause in its constitution (dating from 1956) the Hartley District Progress Association was set up to ‘generally improve the living conditions within the District of Hartley and to provide cultural, social, sporting and other advantages for the residents of the District of Hartley’. At that time the Hartley Valley was rural; some small mixed farms, a host of apple orchards and then a number of larger rural properties grazing sheep and cattle. Significant changes have occurred since then through rural subdivision, rural residential subdivision and the development of rural land concessional allotment entitlements. The result has seen an influx of new settlers, families whose breadwinners work in the Mountains or Lithgow or who work remotely with occasional city visits, families with home based businesses, city families acquiring lifestyle or hobby farm properties, a good sprinkling of retirees making a’ tree change’ with a number of larger traditional rural holdings remaining. The demographic of the valley has totally changed. In light of the change in the Valley demographic it is appropriate to revisit the objectives of the HDPA. 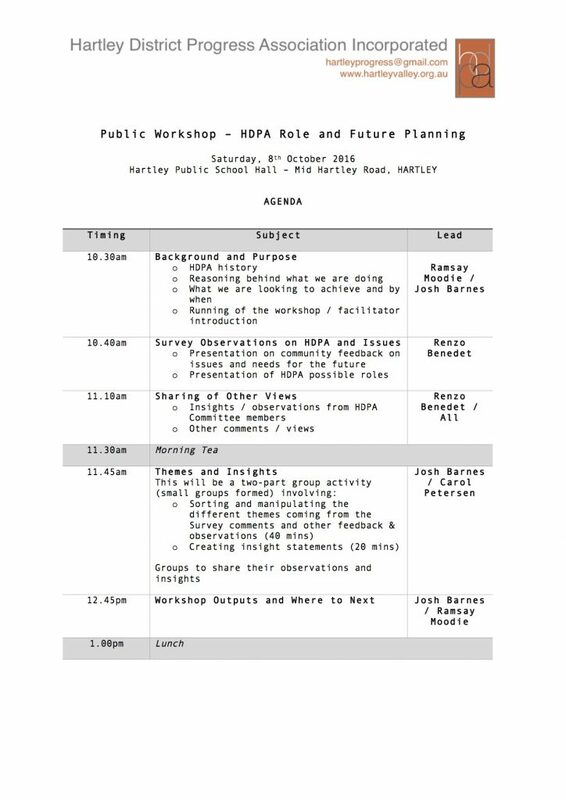 What should the HDPA be doing to ‘generally improve living conditions’ in the Valley? Should we be advocates for rural sustainability, for the environment, for local infrastructure, for economic development, for local planning considerations, for heritage, for governance? Should we be a community builder, a communicator of issues, a source of information? Alternatively should we be no more than we are. To address these questions we are proposing to use a process driven by a methodology know as ‘Design Thinking’ to determine what the HDPA should look like to serve the needs of a twenty first century community. Design thinking starts with a goal, instead of solving a specific problem. Through a Design Thinking process we aim to uncover the problems and needs within our community as a way of determining the future ‘design’ or strategic direction of the HDPA. The committee of the HDPA, in a process led by one of our members Josh Barnes, has held an initial workshop, facilitated by a trained Design Thinking practitioner Carol Petersen, in which we explored a Design Thinking approach to how we might progress this project. Out of that session tasks have been allocated to individual members to gather views of people from different sectors of the community and to look at how other similar organisations work. The results of this work will be brought to a workshop to be held on Saturday 8th October at which we will endeavour to assemble a collective view on what the broader community thinks. To be part of that workshop please register your interest with Sue Jack our secretary at hartleyprogress@gmail.com and she will provide details.